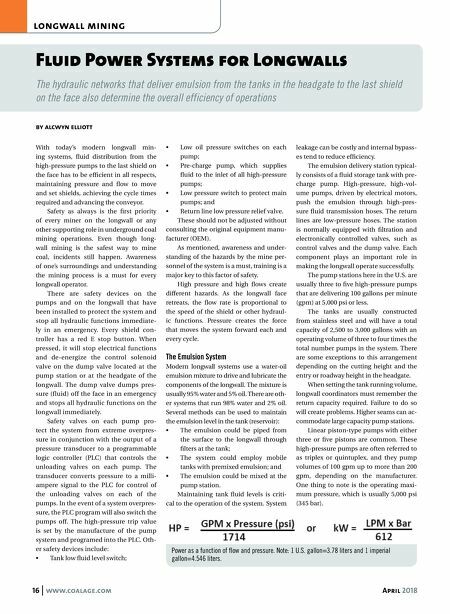 16 www.coalage.com April 2018 longwall mining Fluid Power Systems for Longwalls The hydraulic networks that deliver emulsion from the tanks in the headgate to the last shield on the face also determine the overall efficiency of operations by alcwyn elliott With today's modern longwall min- ing systems, fluid distribution from the high-pressure pumps to the last shield on the face has to be efficient in all respects, maintaining pressure and flow to move and set shields, achieving the cycle times required and advancing the conveyor. Safety as always is the first priority of every miner on the longwall or any other supporting role in underground coal mining operations. Even though long- wall mining is the safest way to mine coal, incidents still happen. Awareness of one's surroundings and understanding the mining process is a must for every longwall operator. There are safety devices on the pumps and on the longwall that have been installed to protect the system and stop all hydraulic functions immediate- ly in an emergency. Every shield con- troller has a red E stop button. When pressed, it will stop electrical functions and de-energize the control solenoid valve on the dump valve located at the pump station or at the headgate of the longwall. The dump valve dumps pres- sure (fluid) off the face in an emergency and stops all hydraulic functions on the longwall immediately. 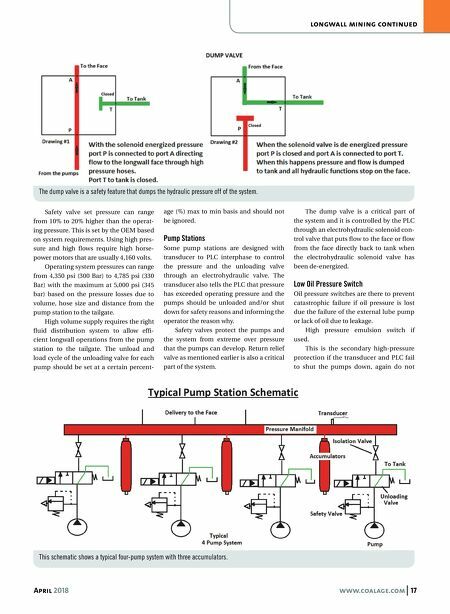 Safety valves on each pump pro- tect the system from extreme overpres- sure in conjunction with the output of a pressure transducer to a programmable logic controller (PLC) that controls the unloading valves on each pump. The transducer converts pressure to a milli- ampere signal to the PLC for control of the unloading valves on each of the pumps. In the event of a system overpres- sure, the PLC program will also switch the pumps off. The high-pressure trip value is set by the manufacture of the pump system and programed into the PLC. Oth- er safety devices include: • Tank low fluid level switch; • Low oil pressure switches on each pump; • Pre-charge pump, which supplies fluid to the inlet of all high-pressure pumps; • Low pressure switch to protect main pumps; and • Return line low pressure relief valve. These should not be adjusted without consulting the original equipment manu- facturer (OEM). As mentioned, awareness and under- standing of the hazards by the mine per- sonnel of the system is a must, training is a major key to this factor of safety. High pressure and high flows create different hazards. As the longwall face retreats, the flow rate is proportional to the speed of the shield or other hydraul- ic functions. Pressure creates the force that moves the system forward each and every cycle. The Emulsion System Modern longwall systems use a water-oil emulsion mixture to drive and lubricate the components of the longwall. The mixture is usually 95% water and 5% oil. There are oth- er systems that run 98% water and 2% oil. Several methods can be used to maintain the emulsion level in the tank (reservoir): • The emulsion could be piped from the surface to the longwall through filters at the tank; • The system could employ mobile tanks with premixed emulsion; and • The emulsion could be mixed at the pump station. Maintaining tank fluid levels is criti- cal to the operation of the system. System leakage can be costly and internal bypass- es tend to reduce efficiency. The emulsion delivery station typical- ly consists of a fluid storage tank with pre- charge pump. High-pressure, high-vol- ume pumps, driven by electrical motors, push the emulsion through high-pres- sure fluid transmission hoses. The return lines are low-pressure hoses. The station is normally equipped with filtration and electronically controlled valves, such as control valves and the dump valve. Each component plays an important role in making the longwall operate successfully. The pump stations here in the U.S. are usually three to five high-pressure pumps that are delivering 100 gallons per minute (gpm) at 5,000 psi or less. The tanks are usually constructed from stainless steel and will have a total capacity of 2,500 to 3,000 gallons with an operating volume of three to four times the total number pumps in the system. There are some exceptions to this arrangement depending on the cutting height and the entry or roadway height in the headgate. When setting the tank running volume, longwall coordinators must remember the return capacity required. Failure to do so will create problems. Higher seams can ac- commodate large capacity pump stations. Linear piston-type pumps with either three or five pistons are common. These high-pressure pumps are often referred to as triplex or quintuplex, and they pump volumes of 100 gpm up to more than 200 gpm, depending on the manufacturer. One thing to note is the operating maxi- mum pressure, which is usually 5,000 psi (345 bar). Power as a function of flow and pressure. Note: 1 U.S. gallon=3.78 liters and 1 imperial gallon=4.546 liters.